Seriously, this puzzle is making me bug eyed! There should be a warning label on this puzzle! Warning; this puzzle may seriously piss you off and make your eyes feel like you rubbed them on sandpaper. I am pissed, I thought I could make it trough this third today, but I just can't focus anymore. Time for some shut eye so I can dream about dots! Fresh start tomorrow. It should start getting faster soon as I have worked through a good number of pieces. Hopefully tomorrow you will be able to knock it out and feel the immense satisfaction of a job well done and well earned. Ummmmmmmm, I TRIED to talk you out of it! LOL....you know I'm just playing with you! 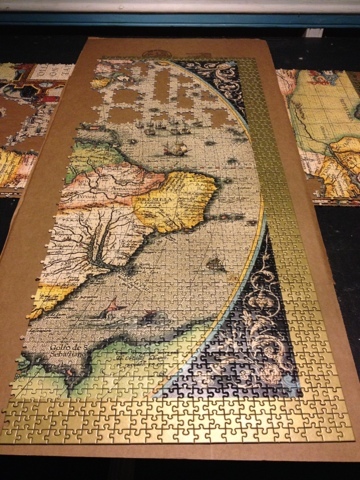 I've actually wanted this puzzle for a long time, even before I found your blog. When I was first looking at the Life puzzle I was tempted by it, but resisted due to the gold border. Although it sounds like the gold border may be the least of the problems with completing this one.